From the political, business and academia worlds, along with top professionals in the private and public sectors - hundreds gathered together in downtown Los Angeles on Oct. 20 to welcome U.S. Secretary of Education Arne Duncan during his nation-wide tour in support of President Obama's Early Learning agenda. 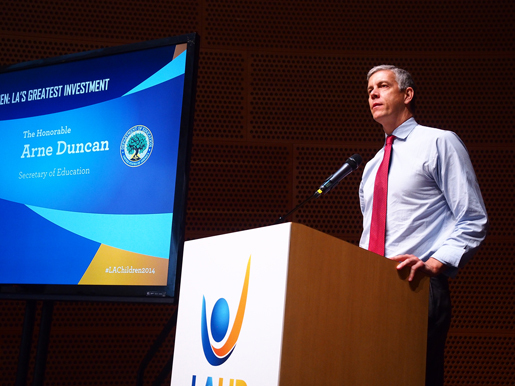 Speaking at the “Children: LA’s Greatest Investment” forum, held at the Walt Disney Concert Hall, Duncan pointed out the disparities between the way our government invest in early education versus around the world. "We rank somewhere between 20th and 25th in regards to providing high-quality, early learning opportunities to children between the ages of 0-5, and that is not a badge of honor," said Duncan. "We should be ashamed. It's our duty to give our children the chance to embrace a great start." The forum examined quality in early learning and public policy to support early childhood education. Experts in education, philanthropy, government and the business community discussed President Obama’s early learning agenda and efforts in Los Angeles County to support early learning. First 5 LA Executive Director Kim Belshé, who took part in the Policy and Early Learning Agenda panel, addressed the continuous challenges in sustaining funding for early care and education. "I've worked for two governors and I can tell you meaningful and measureable policy changes by and large is when governors are putting their thumb on an issue and saying 'this needs to happen,'" said Belshé. "The governor has been a reluctant partner as it relates to investments in quality early learning, so together we have work to do across multiple sectors, to help the governor and others understand that this isn't expensive babysitting -- this is an essential investment in our children." Alex Johnson, executive director of the Children's Defense Fund, also noted that a paradigm shift was needed in order to provide early learning opportunities for all children. "We should not be simply focusing on providing early care and education to the few, or the deserving, but looking at it as one of the core fundamentals pieces in order to develop the whole child," said Johnson. "When you look at juvenile justice, you're seeing that we are investing hundreds of millions of dollars at the back end, but what we should be doing is investing at the front end." The event was presented by LA n Sync, LAUP, First 5 LA, LA Area Chamber of Commerce, Advancement Project, Scholastic and the California Community Foundation.